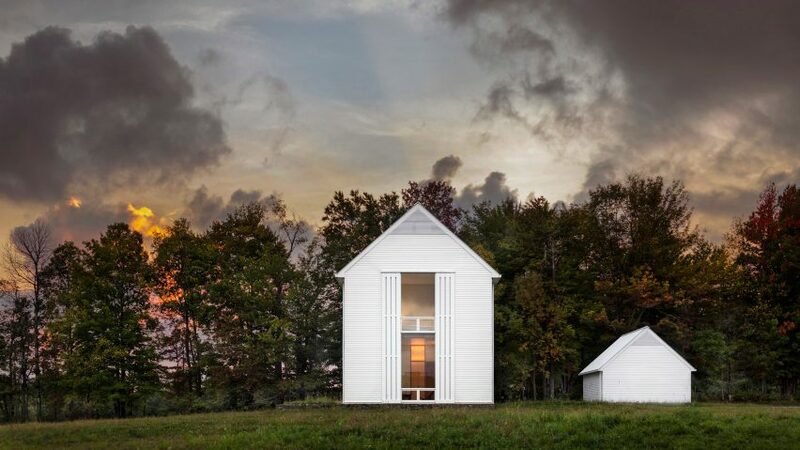 Double-height rolling shutters can open up or enclose this farmhouse in Pennsylvania that Cutler Anderson Architects designed for a rural property. Situated outside the town of Lakewood, the compact white house was designed to echo the style of surrounding farm buildings, and to make the most of the client's restricted budget. "We designed the 3,000-square-foot (278-square-metre) building with a low surface area-to-volume ratio in order to save costs and simultaneously reflect the simple white form of the practical farmhouse architecture of this region," said Cutler Anderson Architects, based in Washington state. The pitched-roof building sits at the crest of a rolling hill. To maximise daylight, the southern facade features expansive windows, particularly in the centre of the home, where the architects included a double-height living room. On the ground floor, a kitchen and dining area occupy the west end of the longitudinal plan, while the sitting room is across from the master bedroom. All of these spaces open out onto a generous south-facing terrace that overlooks the property, while service areas were placed to the north. Three additional bedrooms are located on the second level, at either extremity of the home. They are connected by a walkway above the main social space. This allows the living room to have particularly high ceilings, and receive ample natural light. In hot weather, the expansive openings can be shaded by a system of rolling shutters, which still allow some light through their gaps even when closed. Despite their similar materials and colour, the vertical slats of the shutters are differentiated from the home's cladding, which is horizontal. "The two-story rolling sunshades were designed to respond to solar gain through the south-facing windows while allowing excellent daylighting, and enable the building to be safely closed for periods of time when the owners are absent," the architects said. Local Pennsylvania bluestone was used for the terrace outside the home, as well as wiring for a photovoltaic array is installed for future use. The interiors were completed in a minimalist style, with elements like a wood-burning fireplace and a spindle-legged dining table nodding to the home's vernacular influences. Pennsylvania is home to some iconic architecture, such as Frank Lloyd Wright's Fallingwater House, and the home Robert Venturi built for his mother. More recent projects include a townhouse in Philadelphia that is organised around a plywood core, and a home with a curved black brick facade by design studio Qb. Cutler Anderson has also completed a home perched above a pond in Oregon, and another nestled amongst tall boulders in the remote region of Western Alberta. Photography is by David Sundberg of Esto.